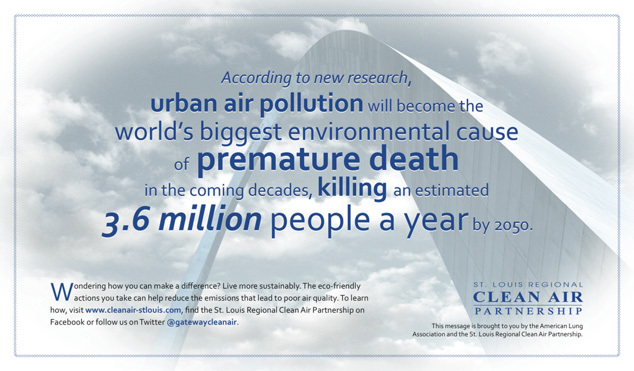 Visual Lure was recently contracted to design a group of ads for the St. Louis Regional Clean Air Partnership (SLRCAP). SLRCAP is a St. Louis based non-for-profit, fighting for, and educating individuals and company about the importance of clean air in the St. Louis region. This year’s ads feature staggering statistics about the effects and consequences of air pollution. To learn more about what you or your company can do to improve the air quality in our region visit www.cleanair-stlouis.com. Visual Lure® has just launched the new St. Louis Regional Clean Air Partnership (SLRCAP) website. SLRCAP is a non-for-profit organization dedicated to educating and increasing awareness about clean air in the greater St. Louis Metropolitan area. They provide tips for both individuals and businesses that will help improve the air quality in St. Louis. 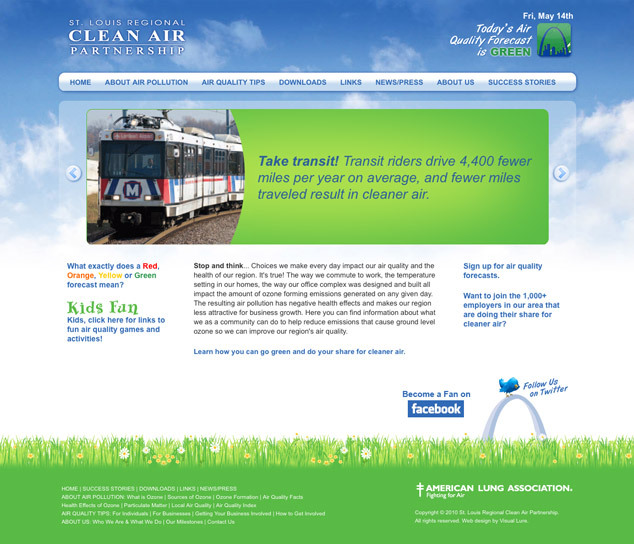 So do your share for cleaner air and visit the new web design here: www.cleanair-stlouis.com.